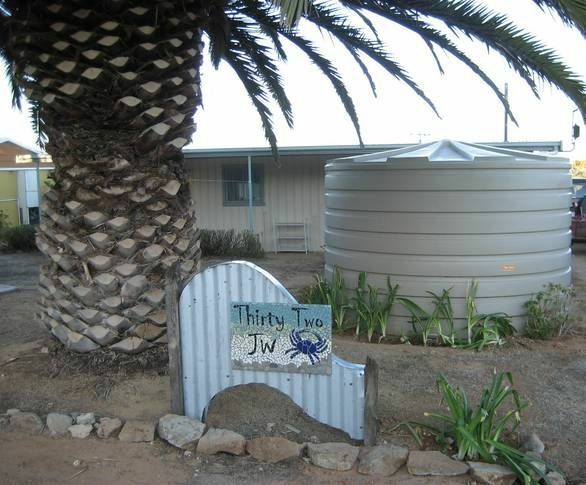 Nestled amongst a small group of traditional shacks, Thirty Two JW is a cute, cosy and comfortable 3 bedroom beach front property located in the peaceful holiday destination of James Well on beautiful Yorke Peninsula. The shack has a warm, inviting atmosphere and comprises 3 bedrooms, sleeping 6 (1 queen bed, 1 double bed and 1 set of bunk beds). The main area of the shack is a combined kitchen/dining/lounge area with a reverse cycle air conditioner. The kitchen might not be as 'modern' as some (you will need to collect hot water from the bathroom to wash your dishes as the kitchen sink supplies cold water only - just like the old days!) but it is well equipped with an electric oven/hotplates, microwave, coffee machine to make that cappuccino to start your day and all the crockery, cutlery, glassware and cookware that you will need. There are plenty of DVD's to watch on the flat screen TV or you can play a game on the Xbox. Games, books and magazines are also there for your enjoyment. The bathroom consists of a shower and toilet but no bath. Please note that you will be required to supply all your own linen (quilts, sheets, pillows, towels, tea towels, bathmats, beach towels, hand towels). Some blankets are provided. We have a dog ourselves and she absolutely loves the beach! We think it's important that your pets can be part of your getaway too and as such pets are welcome. We do ask that you bring your own dog bed with you and do not allow your furry companions on any of the furniture. A reminder that Thirty Two JW is not a fenced property. James Well is renowned for its fishing and crabbing (any month with "R" in it is when you will have the most luck with the 'bluey's'). Crabbing equipment is available for your use in the shed. Two minutes down the road is the Rogues Point boat ramp which is tidal and has a great permanent beach shelter which is perfect for the hot weather. Ardrossan is only 6km away and provides a fantastic 7 day supermarket, 2 hotels, hospital, service station, golf course, tennis courts, ATM, fabulous bakery, laundromat, police station and hardware stores so any supplies you may need are only a short drive away. Leisurely walks on the beach, reading, relaxing or exploring all that Yorke Peninsula has to offer - you can do it all at James Well. An ideal location for a summer beach holiday or cosy winter getaway. We will so be back.. An amazing little gem of a home. Second time we have stayed here everthing is perfect weather, crabs, shack didn't want to leave credit to the owners everthing said on website is as on arrival and we have left it ready for the next visitors. Beach frontage with a beautiful view. It appeared to cater for all ages with regards to facilities. It was clean and presentable.